I spent a lot of my precious free time in 2013 reading books. I have mostly been keeping a record of them on Goodreads. On the one hand, it's a good site for doing so; on the other hand, I'm not always thrilled with putting my content under the control and for the profit of someone else. So I'm going to link to reviews for all of the "books" I read in 2013. The total is more impressive than it should be, because Goodreads allows you to review many pieces of short fiction, especially those nominated for awards. Since I voted on the Hugo awards this year, I read a lot of that type of work. So I'm going to go ahead and link to my Goodreads reviews where I have them. Because makes sense to me, I'm going to group the books by author, and then by date read. I had been interested in reading the Vorkosigan Saga for a while, but I was pushed to do so when Captain Vorpatril's Alliance was nominated for a Hugo. I prefer to read a series in order, which was difficult because Captain Vorpatril's Alliance is (by one reckoning) the 14th book in the series. I broke that rule here, but I have been catching up. The Warrior's Apprentice 4 stars "Once again, the Vorkosigan saga gives me a book that is not about the big, deep, mind-blowing questions that I like to see in a five-star book -- rather, it gives me a fun book with more subtle characterization than you see in most sci-fi works." Ethan of Athos 5 stars "The one thing I feel that is missing from most of the [other Vorkosigan saga] books is the "big picture" questions that science fiction is capable of addressing. In this books, issues of gender that Bujold addresses obliquely in other books come to the fore." Borders of Infinity 5 stars "This collection of three novellas goes from strength to strength." Brothers in Arms 4 stars "This novel is fundamentally a story about clones, which makes it inherently ridiculous." Mirror Dance 4 stars "In general I like this book (I just skimmed the torture scenes). As usual, Bujold plums her characters' psychological depths with tremendous deftness." Miles in Love 5 stars "This is an omnibus edition...If I had to rate them individually, I'd give Komarr 4 stars, A Civil Campaign 5 stars and Winterfair Gifts a weak 4 stars." I'm not sure I get the point of the "open pen name", but I read two books each by Grant and McGuire, who are the same person. I don't intend to read more. Countdown: A Newsflesh Novella 4 stars "I was not expecting to like this novella, since I'm not a big fan of the zombie genre. I was very pleasantly surprised, however." San Diego 2014: Last Stand of the California Brown Coats 2 stars "Ugh. I really don't like zombies, and it doesn't help when every character makes repeated references to the "zombie apocalypse." And yes, the novella explained to the reader just how wonderful science-fiction fans are." Rat-Catcher 3 stars "Since I'm not excited about either cats in fiction or fairies (the cats in the story are essentially a type of fairies), it didn't do much for me." In Sea-Salt Tears 3 stars "I liked it marginally better than Rat-Catcher." I read the two most-recent novels in her Temeraire series this year, as well as a short story. Feast or Famine 4 stars "I was skeptical that Novik could pack much into fewer than 2000 words, but it was enough to bring a smile to my face." Blood of Tyrants 4 stars "The latest Temeraire novel is divided into three parts. I don't think I could improve upon another reviewer's comment on the first part: "If I could pretend this never happened, I would."" Two of her short works were nominated for Hugos. I had mixed reactions. On a Red Station, Drifting 2 stars "Maybe this could have been three stars; I'm on the fence." Immersion 4 stars "I was disappointed in this...until about halfway through when something "clicked" with me." This new author has really impressed me with her Seraphina series. I'm looking forward to the second book. The Audition 4 stars "It is a nice little piece that contains many of the subtleties that made Seraphina enjoyable." Seraphina 5 stars "I regret not reading this book before the Hugo nominations closed." I occasionally read books by men in 2013. More Baths, Less Talking 4 stars "Having someone witty and erudite discuss books you're not going to read is perhaps better than discussing books you've already read." Fan Mail 5 stars "If I could have Nick Hornby as a guide, I would follow whatever soccer he wrote about." I am cheating a little bit by grouping these two books under Martin, since one is a book he co-authored, and another is a collection he co-edited. Windhaven 4 stars "The book has held up well over the years.While I have no specific complaints about it, neither did I find it a compelling page-turner." Old Mars 3 stars "I wish I hadn't read this book. It wasn't a bad book. It's just that it took up valuable space in my reading schedule, and I'm still not sure why." The Cassandra Project 4 stars "I wasn't disappointed, but I wasn't bowled over, either." Starhawk 4 stars "It's a solid prequel, but it lacked the philosophical depth I find in others of the author's books"
The Last Policeman 5 stars "I finished this book very quickly, and even when I wasn't reading it, I spent a lot of my time thinking about it -- both are evidence of how compelling the book is." Throne of the Crescent Moon by Saladin Ahmed 3 stars "I was leaning towards four stars until I realized that I have little interest in reading the sequel." Backscatter by Gregory Benford 3 stars "This short story is freely available online at Tor.com. It's a throwback to old-school science fiction, which is both good and bad." The Demolished Man by Alfred Bester 2 stars "The Demolished Man had two strikes against it -- it is 60 years old, so a lot of it feels anachronistic, and it features ESP prominently." The Girl-Thing Who Went Out for Sushi by Pat Cadigan 2 stars "I kind of liked the characters and the setting, but it was hard to slog through the style." Bossypants by Tina Fey 5 stars "This was a light, quick read." Atom Drive by Charles L. Fontenay 3 stars "A solid Golden Age story...exciting science, flat characters." Rangers FC - We Don't Do Walking Away by Lisa Gray 3 stars "This book is essentially a series of match reports with just a little bit of background and personal reflection added." The Boy Who Cast No Shadow by Thomas Olde Heuvelt 3 stars "A well-executed story, but not one that connected with me." The Killing Moon by N.K. Jemisin 2 stars "I fell asleep every time I picked it up, and didn't finish any books until a month later when I set it aside." Mantis Wives by Kij Johnson 2 stars "Even if you find the joke funny (I didn't), it's just a one-joke story." The Stars Do Not Lie by Jay Lake 3 stars "The characters are kind of neat, and the setting has some promise, but the ultimate payoff is not fantastic." Mono no Aware by Ken Liu 4 stars "This is a nice, clean science fiction story set aboard a generation spaceship that has been launched to save a remnant of humanity from a killer asteroid headed towards Earth." Someone Could Get Hurt by Drew Magary 4 stars "This was a quick, funny read, with a few literal laugh-out-load moments." New World Mindfulness by Donald McCown 4 stars "This book is excellent for those looking for an introduction to the concept of mindfulness without a heavy dose of Buddhism." The Long Earth by Terry Pratchett and Stephen Baxter 3 stars "The main two characters in the book (one of them an AI) speak to each other in ways that sound like a 14-year-old nerd's idea of witty banter." The Emperor's Soul by Brandon Sanderson 4 stars "It fell short of five stars for lacking the intangible elements that would make me want to stay up late to finish it, or urge others to read it once I was done." Redshirts by John Scalzi 2 stars "It was a struggle to get through this book, though less so as it went along." Tales of Majipoor by Robert Silverberg 5 stars "It is sad to think this book represents my final visit to Majipoor." The Emperor of Mars by Allen Steele 4 stars "It was a very enjoyable tale of someone on a realistic version of a future Mars who finds mental refuge in older, less realistic visions of Mars." Fade to White by Catherynne M. Valente 3 stars "The 1950s-parody style wore thin pretty quickly." With the not-much-lamented demise of The White Tiger, Bowie is without Indian food. 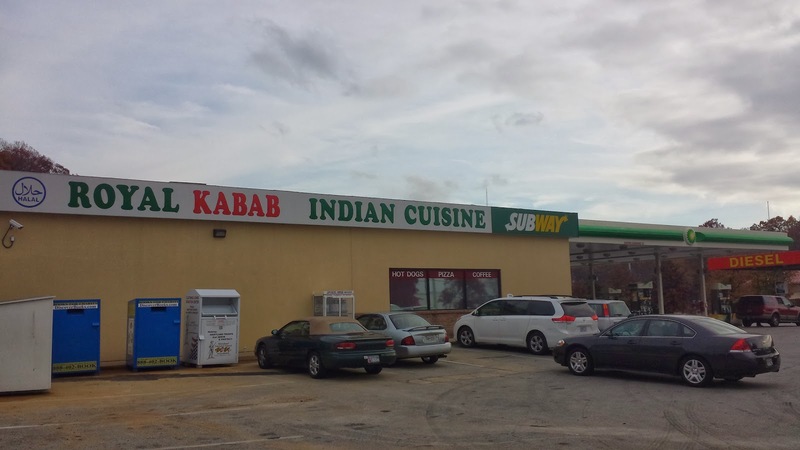 Those looking for some Chicken Tikka Masala have to head up Route 3 to Gambrills, to a gas station of all places. Now one of my rules is, "Don't eat in a gas station," so I hesitated going here. But I had heard such good things about this place that I decided to try it anyway. On my first visit, I got the lunch buffet. The offerings had not been freshened recently, but were still quite good. The proprietor brought us some salad and enthusiastically encouraged me to come back for more once he had put out new food. I ate more than I planned to, and more than I should have, which is probably the strongest endorsement I can give this restaurant. My colleagues who got items off the menu were also quite happy. The second time I visited, I had the chicken tikka kabab. I enjoyed it, but I was less thrilled. If the buffet is available, I don't think I will plan to get anything else. I've had better Indian food, but not within 20 minutes of Bowie. If you're willing to drive half an hour, go to Tiffin along Route 193 in Takoma Park. That's a restaurant I could give 5 stars to. I'm hesitant to give 4 stars to a place with the ambiance of Royal Kabab, but as the only Indian option in the region, and a tasty one, it gets 4 stars. 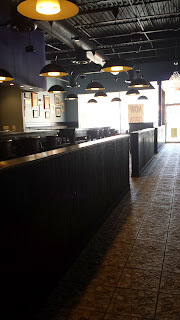 I am once again consolidating the reviews of several chain restaurants into one post. "We're out of dough." "What?" "We're out of dough." That's not an auspicious way to start a visit to a restaurant that has "pizza" in its name. I soon clarified that they were out of the personal pan pizza dough, but that they had the dough to make the other pizzas. I declined an offer to pay more money for a larger pizza and decided to return the next day, after they got a delivery. They didn't get the delivery, but the next time the woman behind the counter offered to make me a personal pan pizza with non-regulation dough, and I took her up on it. It was an adequate pizza. I seem to recall that they had table service (or at least a lunch buffet) in the 1990s, when I last ate there. Now it's ordering at a counter. I'm not sure why the Starbucks and Pizza Hut inside Target are considered part of the same restaurant. The Starbucks part doesn't really contribute to the restaurant-ness, though, so I ignored it. They didn't have any pizza ready to go when I visited around 1pm, so I had to wait, which was kind of weird. They were really nice about bringing my pizza to me in the little seating area. The pizza was below Pizza Hut standards, but edible. I would compare this place to the 1-star Uno Express inside BJ's club. You don't have a lot of choices in the Gateway Shopping Center with Monterey closed, but honestly, head to Wendy's or Bob Evans before you head here. 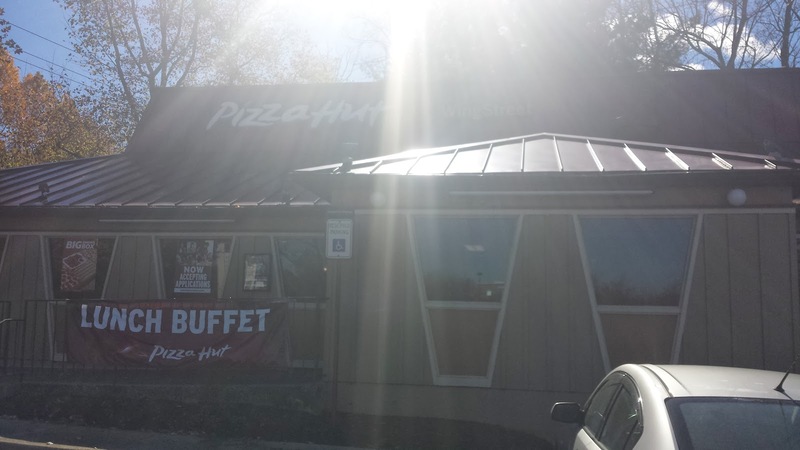 This Pizza Hut is the only one in Bowie with wait service, and the southernmost restaurant in Bowie. My rule for restaurants with wait service is that I have to have a dining companion for at least one visit. That way, I don't just get absorbed in reading stuff on my phone and ignore the quality of the service. The Pizza Hut was one of the harder sells from the list, and one of the reasons this review is towards the end of the Project. Nevertheless, I suggested that Ben and I stop by here on the way to the Redskins game last weekend for a pre-game meal. He and I were debating partners in high school, and it was our tradition to find a different Pizza Hut after each debate tournament. I doubt we ever made it to this one. Sadly, Pizza Hut no longer carries birch beer, a staple of our 1980s visits. The wait service was really friendly. The focus clearly isn't on the dine-in experience, though. 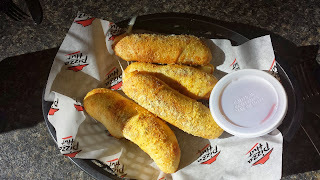 If you go to the web site to look at the menu, your two options are carryout and delivery. The pizza and appetizers were pretty good, and we got a lot of food (and sodas) for two people for around $20. So I'm going to give this a surprisingly high 2-and-half star rating. Here's my reasoning. 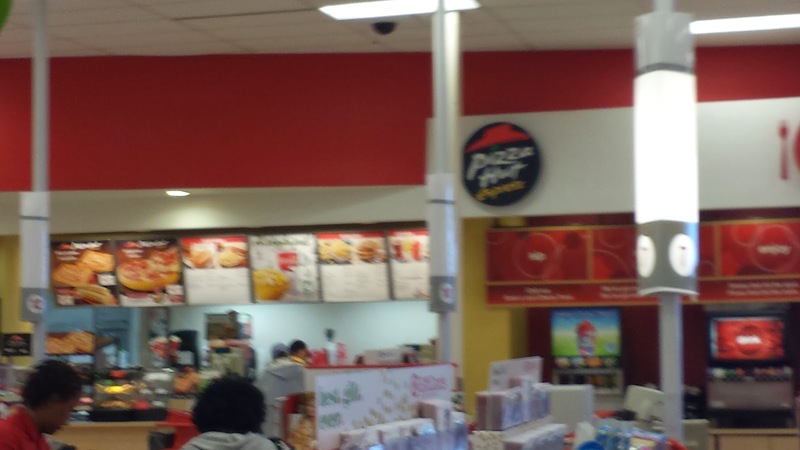 You can get a personal pan pizza there for $3.25. That's a cheap date. 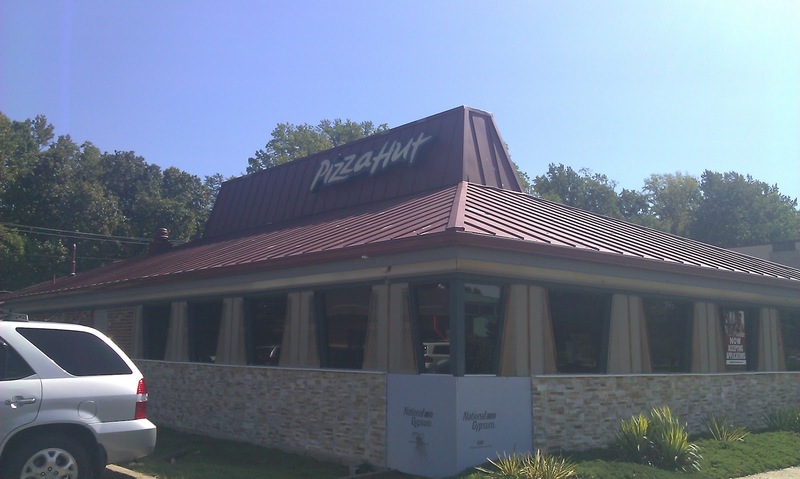 In other words, this Pizza Hut may be the cheapest place in Bowie to go and be waited on. For teenagers, that's important, since it introduces them to the art of dinner conversation with someone other than their family. So for an inexpensive place to go eat with your friends, and one of the few places in South Bowie, it gets 2-and-a-half stars. For the rest of us, go to Uno, or for takeout, Cetrone's, instead. In June, I posted the above image giving an overview of the journey of Free State Mover #1, my geocoin that had reappeared after four years of inactivity. Well, it's now back in Maryland and awaiting pickup. It bounced around Massachusetts for a while, headed to West Virginia (not the close part), and then landed in a cache not too far from Rock Creek Trail in the North Chevy Chase area. I'll have to plan an expedition to retrieve. If you want to have a steak in Bowie, LongHorn is a decent choice. I would probably prefer Outback, but I think that's a matter of personal preference, rather than quality. Also, LongHorn is open for lunch, so there's no competition there. I bet Old Bowie Town Grille does a pretty good steak, too. 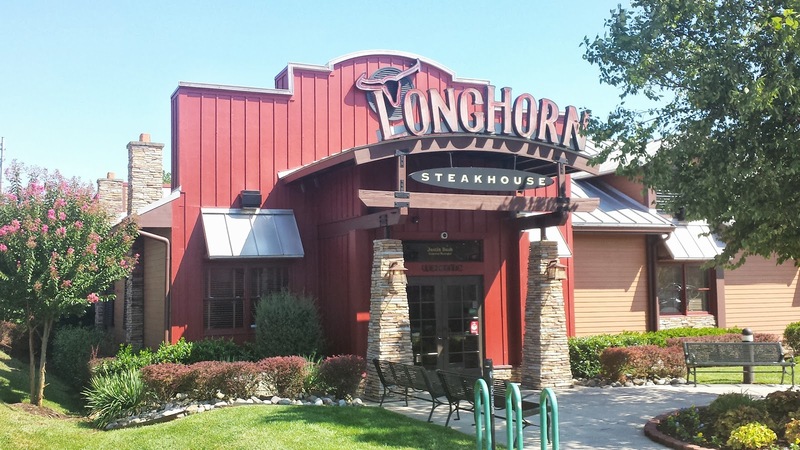 But for being right there in Bowie Town Center and being a decent chain, LongHorn earns 3 stars. To make the trip more exciting, colleagues of mine and I headed to LongHorn via the BizBus, Bowie's new shuttle bus. The experience was nice enough. If I were heading to Bowie Town Center from Melford, there's not that much advantage to driving. On the other hand, the driver said that we were the first people he had ever picked up from that particular stop, so I think ridership has a way to go. We all enjoyed our meals. 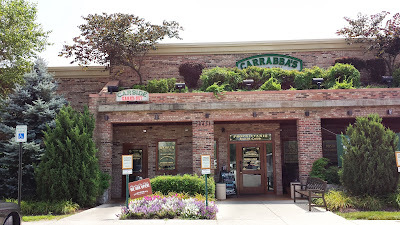 The service was excellent, if not speedy, and the food was cooked as ordered. Prices were a bit high for lunch, but on the other hand, you get to eat steak, so that's not a surprise. A return engagement for takeout food was slightly less successful, with my burger a little overcooked, and the fries somewhat disappointing. A confession: I forgot that I hadn't written a review of LongHorn, and two months on, I struggled to remember much about the visit. On the one hand, that's a strike against it -- not memorable. On the other hand, it had no memorable deficiencies, so I think an "average" rating of 3 stars is appropriate. Olive Grove is opening next Wednesday, November 13. I'm planning to visit with co-workers the following week to check it out. Not counting Olive Grove and other yet-to-open restaurants, I have eight restaurants left in Bowie that I have yet to review. Three of those are Pizza Huts. I have visited all three; they will be dispensed with in a single post coming up soon. I visited Royal Kabab in Gambrills with some co-workers recently. It is hard to get past the fact that it is in a gas station. 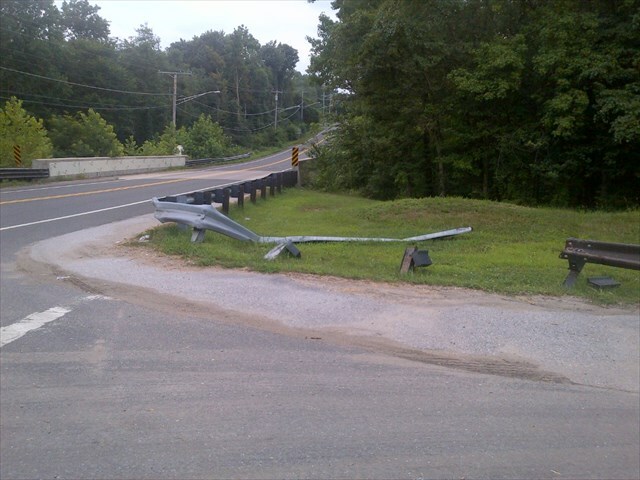 You really need to get past that, however. Not only is it the only Indian/South Asian restaurant in the area (after the demise of The White Tiger), it's good! I will probably add this to my "Beyond Bowie" series after another visit. Bowie could sure use a Mediterranean restaurant. Now, my preference would be for Lebanese Taverna -- if you have the time, the closest one is the Cafe in Annapolis. But since I tend to restrict myself to a shorter radius around Bowie for these reviews, Garbanzo is a nice substitute. Garbanzo opened its Gambrills location in July of this year. It has twenty-some locations, mostly in Colorado, but appears to have an ambitious expansion plan. 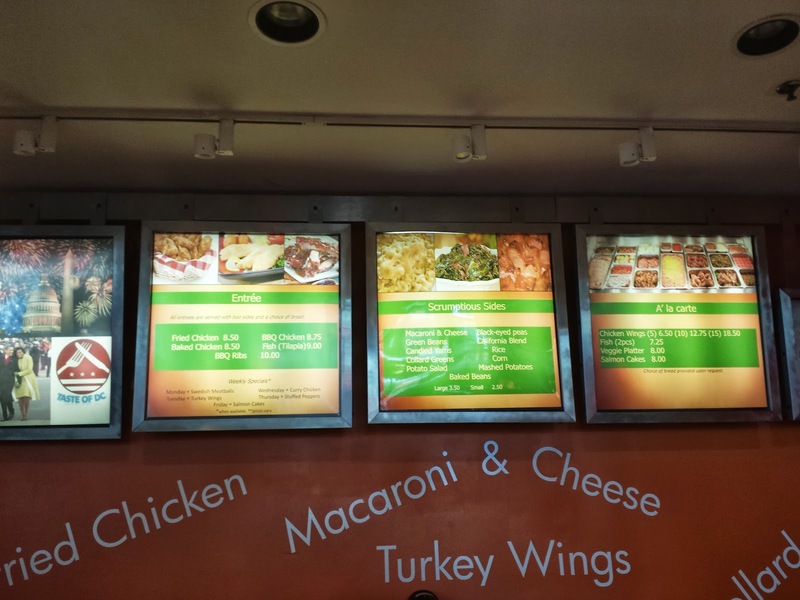 The basic way to order is to choose, pita, laffa or a plate and then add a protein. The first time I was there, the guy behind the counter advised the plate, since you get a pita with that anyway. The proteins are basically falafel, shwarma or "falarma" (a combination), with a couple of other options. The kids meals are a grilled cheese pita, a chicken or steak rice bowl or a stuffed half pita. I should note that Salem and I suffered a little bit of discomfort the night after eating the baba ghanoush, so make of that what you will. Overall, I was very satisfied. I like Mediterranean food. This is good-but-not-great Mediterranean food, and reasonably priced. Given that it's next door to where the kids get their haircuts, I think we'll be going there again. I will also be recommending it to people from work, particularly for its good vegetarian options. I'm still awaiting the opening of three new Bowie restaurants -- Irie Cafe, Olive Grove, and Anthony's New York Pizza & Pasta. 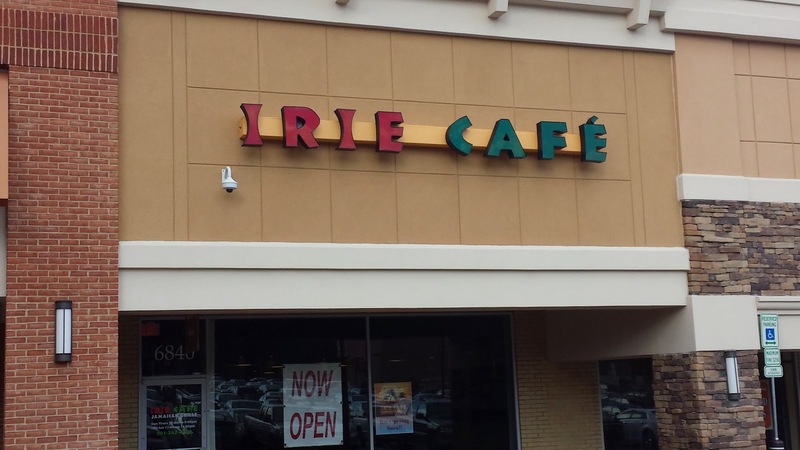 Irie Cafe looks almost done when you peer in the window. Olive Grove has made steady progress and stated a November opening date. Anthony's was doing a lot of work for a while, but it seems to have ground to a halt for some reason. Last weekend I rode the 2013 edition of the Tour Du Port, a bike ride through Baltimore. There were 15, 25, 40, 50 and 60 mile options. I felt good to say that I didn't take the shortest option. On the other hand, it looks like the extra 10 miles on the 25-mile ride were just a tour of Dundalk, which wasn't particularly exciting. 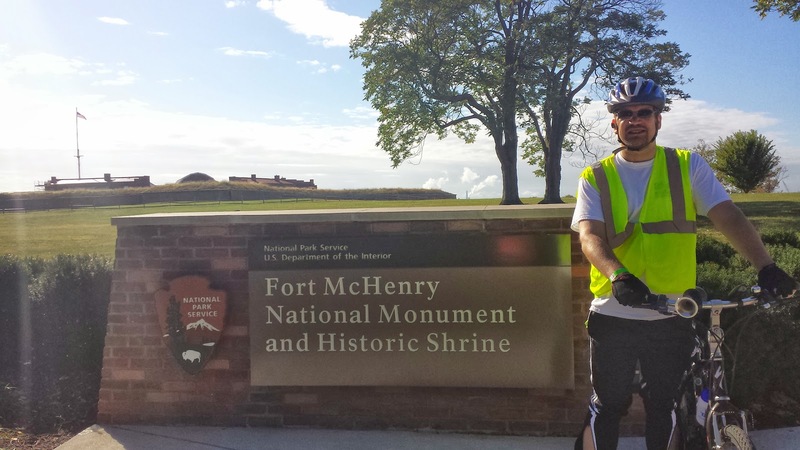 If you did the 40-mile ride, you got to see North Point State Park, which is probably nice, but the second part of my ride seemed sort of tacked-on. I don't know how many of my fellow riders were in it for the scenery. At one point, everybody seemed to be ignoring the cue sheet directions, but somehow following the painted arrows on the street. I figured out that the directions had us take about a 1/3-mile loop through Federal Hill Park, and most people just skipped that. The view of the harbor from the park was one of the highlights of the trip, so I don't quite understand that. Patterson Park, Fort McHenry, and the rest stop at the Aquarium were also quite nice. There's another ride through Baltimore called "Tour Dem Parks, Hon" that I think I'd prefer, if I do another one there next year. While some sights on the urban part of the ride were interesting (someone tailgating in a random street parking space for an away game, a couple still dressed in their going-out clothes after likely having been up all night), I'm not a huge fan of city biking compared to being in parks. All in all, it ended up being my fourth-longest ride, after the ride in Chestertown in June, the ride in Switzerland, and one in Santa Barbara. I think the only way I could do anything significantly longer is if I knew I'd have a long break in the middle (which I did in Switzerland and Santa Barbara). It was nice doing two of these long rides this year, and I hope I can do two or three of them again in 2014. I said that Carolyn Quinn's is "what you'd expect of a home-cooked meal if you visited a friend's house who was a good cook." Chessie's is what I'd expect of a home-cooked meal if I visited a friend's house who wasn't a good cook, but I had to eat it anyway to be polite. After I read the Gazette's article that talked about the dinner menu, I figured I would visit once for the lunch buffet and take Christina once for a nice dinner. After my visit to the lunch buffet with colleagues, I determined that Chessie's didn't deserve a separate dinner visit, and Christina didn't deserve to have to eat there. The one good thing I can say about the buffet is that $6.99 is a low price for a buffet that includes a beverage. The day we visited, the surprisingly small selection was barbeque themed. The barbeque pork was somewhat tasty, but everything else just made me a little unhappy to eat. Maybe something you'd get in an institutional cafeteria. When I went back for a second look (as dictated by my rules of reviewing), I was shocked to find the parking lot packed. The restaurant was equally busy. I did a quick web search to see if there was a big meeting that day (my high school actually had its ten-year reunion there), but instead I found that a lot of "lunch bunches" -- Masons, churches, firefighters and whatnot -- have outings to Chessie's on various days. Most of the patrons looked like they were on such outings, and they were disproportionately elderly. If thirty years on, I am with a group of retirees eating such uninspired food, I shall be very sad. I just wanted to check the box of my second visit and skedaddle, but it took a lot of imploring from the wait staff to cough up my check. In the end, I wavered between a half-star and one star. Nothing about the experience was awful. Just not good. But I return to my opening post on this project, "Rather than rating solely on quality and value, I am also going to judge how much the restaurant contributes to the Bowie restaurant landscape." As far as I can tell from my visits, Chessie's causes people to eat there rather than at some better establishment in or around Bowie. So half a star. 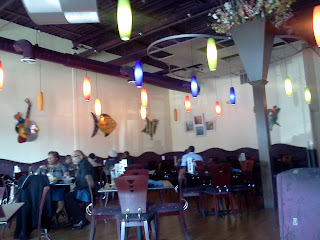 I snapped the photo at right of the Irie Cafe while visiting the similarly-named Chesapeake Grille & Deli last weekend. They seem to be making good progress. It turns out I was mistaken to say that Hunan Delight is takeout-only. They have a small dining area that I somehow missed the last time I was in there. I have to add them back on the list. So I now am down to eight reviews to go. As I near the end of this project, I've started turning my eye to more restaurants outside of Bowie. (I also am looking to recommend places to co-workers who don't care whether something is in Bowie or just nearby.) In my continued quest for good Thai food, we visited the recently-opened Thai at Waugh Chapel. From one visit, I would say it was very good. Well-decorated, good service, tasty food. Not the best place for kids, but the staff was friendly to them. I would say it noses out Lemongrass in Crofton for best local Thai food. I may do a "Beyond Bowie" post there, if it holds up after subsequent visits. I was sad to see that the Sly Horse Tavern in Crofton closed down. While I have only been there once in the past fifteen years, I thought it was nice for Croftonites (I once was one) to have a walkable dinner option. 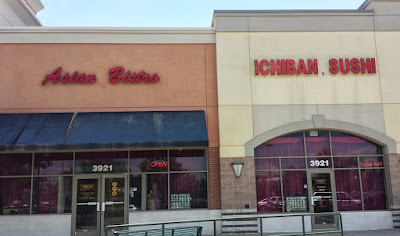 Ichiban Sushi Asian Bistro, 3921 Evergreen Pkwy. I was really hoping to like this place better than I did. My previous visits were all in the days before they annexed the former Dunkin' Donuts location next door and added "Asian Bistro" to their name. At the time it was one of the few place in the area to get sushi, and I remember liking it a lot. On my first recent visit, I got some takeout Thai curry. I had been disappointed in the blandness of East Moon's Thai food, so a colleague's tip that Ichiban now served Thai food seemed like a good excuse to see if I could do better. Unfortunately, the meal was similarly bland, until the end, when I hit a pocket of heat. To confirm that I wasn't just misremembering what Thai food is supposed to taste like, the next day I got a similar meal from Lemongrass in Crofton. It wasn't super-hot, but it had more of a kick, and the flavors just tasted correct. I hope to visit Thai of Waugh Chapel soon in my quest for a Thai place to recommend, but my top recommendation definitely isn't going to be in Bowie. For my second visit, I went with five co-workers. The service was pretty good, although our waitress seemed to depart the table fairly quickly. I had to ask twice to get water along with my tea. I couldn't put my finger on what I didn't love about the miso soup, but one co-worker said, "not enough miso" and another described it as "watery." The salad was fine, but the sushi was underwhelming. There was nothing wrong with it, but I didn't get that, "Oh boy, I'm eating sushi" feeling I usually get. I was tempted to give it 3 stars on the basis of my memories from a few years back, and the fact that my co-workers were more enthusiastic than I am, until I thought of another element. Prices. The sushi lunch special at Ichiban is $13 for five pieces of sushi and a California roll. At East Moon, it's $10.95 for seven pieces and a California roll. At Golden Pavilion, it's $11 for the same. I'd recommend either East Moon or Golden Pavilion over Ichiban, with a slight nod to East Moon. The area still doesn't have one sushi place I'd drive past all the others to get to. Christina and I really enjoyed our meal at Fuji in Waugh Chapel recently, but it wasn't better than East Moon. I still have to try Sakura, and a few other non-Bowie locations before I can definitively say there is no "go-to" sushi place in the area. 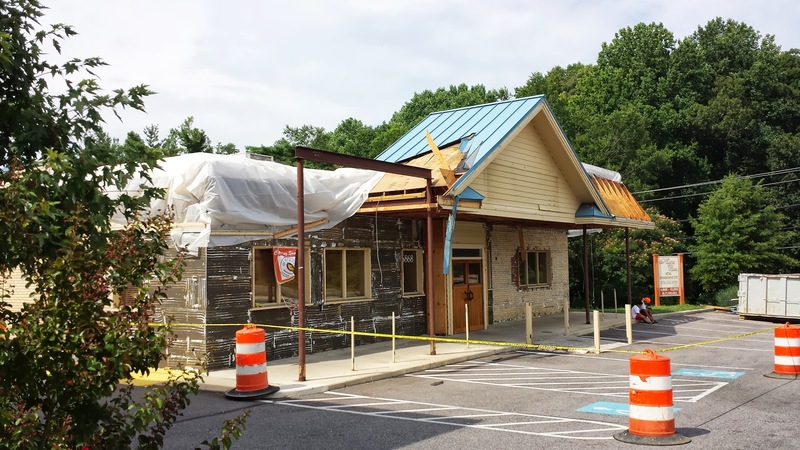 Bowie Living reports that the Olive Grove continues its extensive renovations to the former Outback and expect to open in the fall. Carolyn Quinn's is now closed. 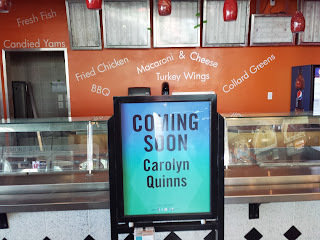 Carolyn Quinn's, 3872 Town Center Blvd. Finally, a reason to visit the food court! Carolyn Quinn's offers homestyle dishes like baked chicken, mac 'n' cheese and cornbread. I am not generally a fan of fried food, but I really enjoyed their fried tilapia. Co-workers I dined with felt that the food was honest and uncomplicated. Don't go expecting a lot of fancy spices. The first time I went there, the co-owner and his daughter were there. He said he (Quinn) and his wife (Carolyn) had combined their name to get the name of the restaurant, and that the food that they were serving comes from family recipes. That's telling -- the food is what you'd expect of a home-cooked meal if you visited a friend's house who was a good cook. He said that he had initially intended a "soft opening" before doing much promotion, but that things had been busy from the start. One promotion you may want to participate in is texting "feedme" to 81680. 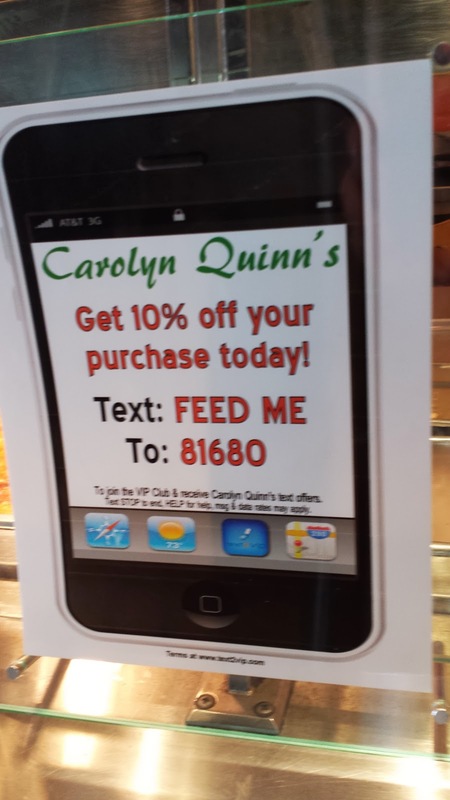 If you do it before you go to Carolyn Quinn's, you get a coupon good for 10% off a meal that day. If you do it after you visit, as I did, that coupon doesn't do you much good, and when you try to use it again, it says you've already gotten your coupon. I think I am supposed to get more coupons eventually, but so far I haven't gotten any. 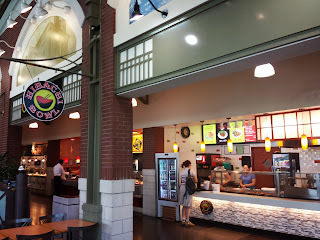 Anyway, not only is it head and shoulders above any other place in the food court, I feel like it starts out in the top tier of Bowie restaurants. 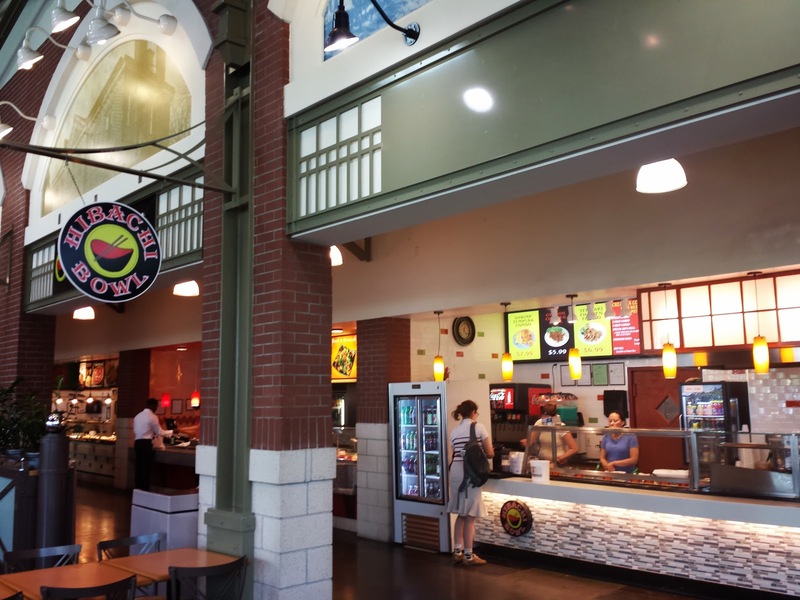 Since you're in the food court, the atmosphere isn't top-notch, and you're not going to find anything that stuns your palate. But the food will be very good, and there's not much else like it in the local area. 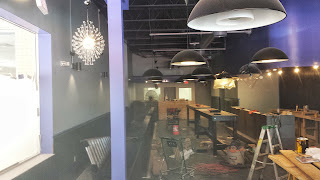 Progress is being made on a couple of other new establishments. The Olive Grove is doing major exterior work on the exterior of the old Outback, and Anthony's Pizza and Pasta has a "Coming Soon" sign and has gotten started on an interior remodel of the old Peepers space. Bowie needs a diner. The "Beyond Bowie" series is designed to spotlight restaurants that Bowie "should have, but doesn't." 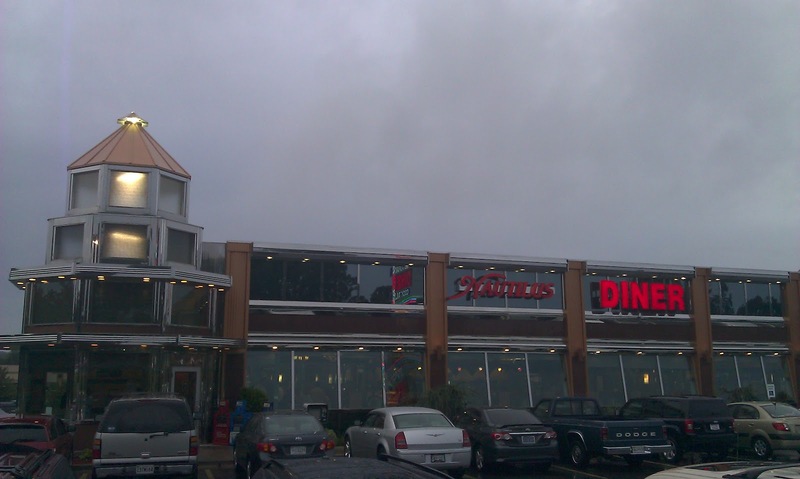 A city of 54,727 people (2010 census figure) should have a diner. But it doesn't. It has an IHOP, but that's not the same thing. Until then, we'll have to continue to head up Route 3 to Nautilus Diner in Crofton. They have everything you'd want in a diner: a novel-length menu, breakfast anytime, Greek specialities (it doesn't have to be Greek, but a diner should specialize in some sort of ethnic cuisine), late-night hours ('til 1 am), desserts and cocktails. I'm a little disappointed it's not 24 hours (though I've never wanted to go there in the middle of the night myself), and I don't like the Greek food as much as Plato's Diner in College Park, but it's still a solid showing. The service has generally been pretty good. If it's slow, they've been known to put us with our toddlers in our own section to give them room to wiggle without disturbing other customers. As I mentioned last summer, one of the geocoins I dropped off abroad with the goal of returning to Maryland made it back near the Sligo Creek Trail. Well, in April, Christina and I left the kids with the sitter, and took a little bike ride down the trail. After some digging through the woods, I emerged with Free State Mover #3, five years and 13,229 miles after I placed it in a cache in Banff, Alberta. In that time, it has been to Sweden, Germany, British Columbia, Washington state, Oregon, Virginia, and then finally back to Maryland. It's currently decorating my biking keychain. We originally grabbed this in Florida. While we had it in our possession we lost it. Recently we stumbled upon it and delivered it to a new home in Washington DC. Found this in Elm Tree #1 in Washington DC and will get it on the road again. Last week they dropped it off in Massachusetts. Oh, well. At least it's back in the game. So, three stars or four stars? It started a bit weakly, but improved. I was leaning towards four stars until I realized that I have little interest in reading the sequel. Just a gut feeling, but enough to knock it down to three. "You should not contemn poetry, my friend. There's wisdom in these lines. About life, death, one's own fate." "No doubt!" Yehyeh aped the act of reading a non-existent book in the air before him, running a finger over the imaginary words and speaking in a grumble that was an imitation of Adoulla's own. "O, how hard it is to be so fat! O, how hard it is to have such a large nose! O Beneficent God, why do the children run a-screaming when I come a-walking?" Before Adoulla could come up with a rejoinder on the fear Yehyeh's own crossed eyes inspired in children, the teahouse owner limped off, chuckling obscenities to himself. I thought the paragraph where Yehyeh pretends to read poetry is a nice, subtle characterization -- which is ruined in the next line, which explicitly mentions his ugliness. Also, at times in the book, the protagonists run into a problem, and then somebody says, "I know somebody who can help," and the next chapter or so involves going to that person for help. It's particularly jarring when the assistance comes from someone who hasn't been mentioned before in the book. Sort of like, "Hey, where does the plot need to go next?" The adventures are entertaining, and by the end of the book, the five protagonists have been more subtly characterized than I initially expected. All in all, a good book, but not one I fell in love with. This is the third of the five nominees for Best Novel Hugo that I have read. I liked it more than Redshirts, but not as much as 2312, so I have my ballot partially ranked. I seem unlikely to finish the earlier books in series with the other two nominees (Blackout and Captain Vorpatril's Alliance) before the deadline, so what should I do -- not give consideration to all of the books, or violate my rule of not reading books in series out of order? For now, I'm sort of ducking the question. When I realized how substantial the nominees for Best Novella are -- one is 192 pages in print, I decided to look there. One advantage to that is that one nominee is part of the Newsflesh series (as is Blackout). It's not entirely fair to judge a book by its prequel, but I am pretty sure I'm not going to like this zombie series, and I at least will probably be OK not giving Blackout a chance if I don't fall in love with the prequel novella. I will probably have to cave on Captain Vorpatril's Alliance since there are so darn many books in the series that I would have to read to catch up, but the quality of the two I have read is high enough that I should give it a chance for my vote. Hibachi Bowl, 3856 Town Center Blvd. I have a rule that I have to visit a restaurant twice before writing a review. 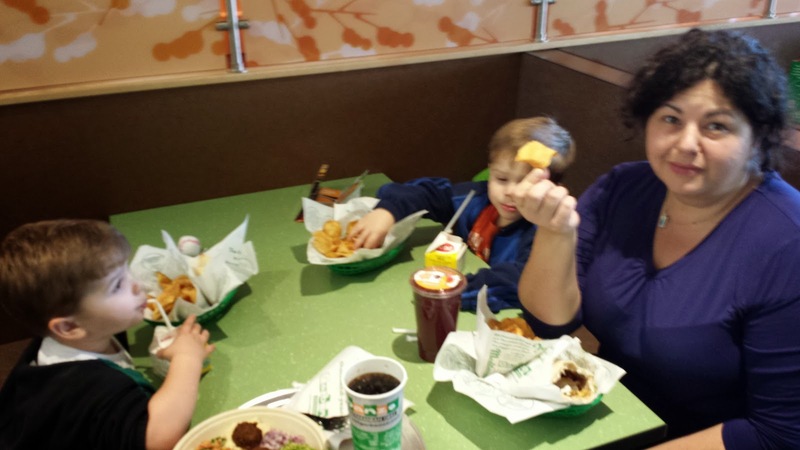 It's a bad sign when your lunch companions try to talk you into breaking that rule after your first visit. But if I hadn't, I would have given this place 0 stars, instead of the coveted half-star. One of our complaints was that "Hibachi" implies Japanese grill, and none of the foods on offer for that first visit were remotely Japanese, nor grilled. They advertised "Teriyaki Chicken," but none was in sight. On my second visit, the guy who operates the grill had shown up, so I had some teriyaki chicken. It wasn't awful. It wasn't good, either. It had nothing to do with an actual hibachi, and there were no bowls in sight. On my first visit, I was offered toothpick samples of all three types of chicken and immediately dreaded ordering a full portion of any of them. If you go, try the Teriyaki Chicken; it doesn't inspire feelings of dread. Even the rice didn't taste very good, though. One colleague said that her vegetables somehow managed to be flavorless without being overcooked. The other colleague declined to eat at Hibachi Bowl and went across the street to Five Guys for a hot dog. She was the day's winner. I don't understand this restaurant's purpose. If you really want bad Asian food, you could just go next door to Asian Chao. But you'd be better off walking across the street to Five Guys for a hot dog. 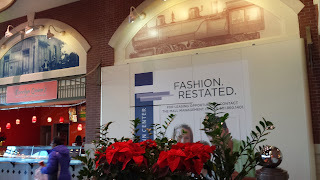 While making my second visit to Hibachi Bowl, I noticed another restaurant is on its way to joining the food court. 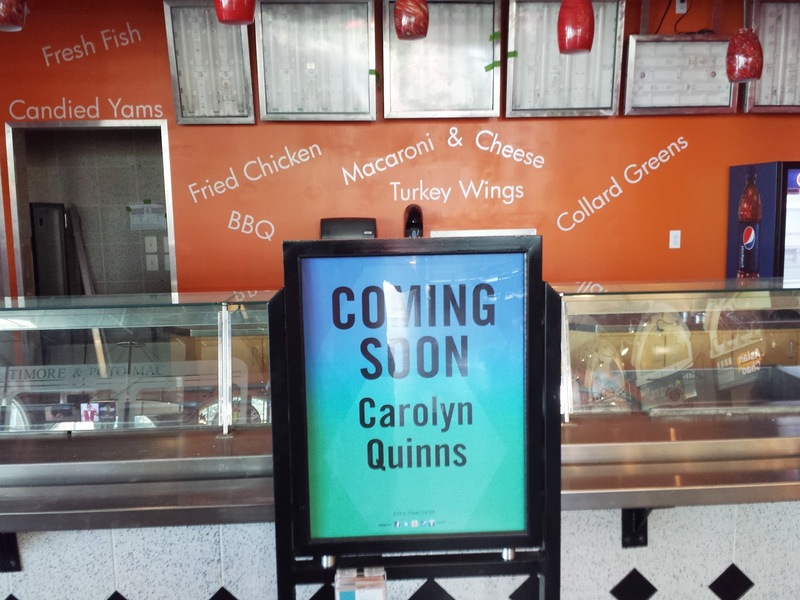 "Carolyn Quinns" will apparently feature fresh fish, candied yams, fried chicken, BBQ, macaroni & cheese, turkey wings and collard greens. Some sort of Southern theme? 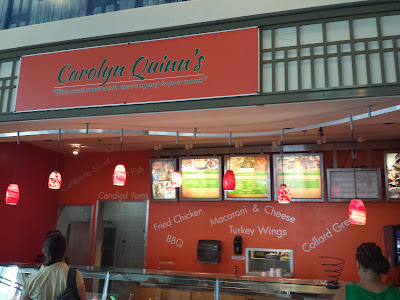 A Google search was fruitless, so I suspect it's not a chain -- there may even be a real "Carolyn Quinn." New restaurants are breaking out all over. The Olive Grove restaurant will be occupying the space in Hilltop Plaza where Outback used to be before it moved. I gather it's like an Olive Garden. Also, Bang Bang Mongolian Grille is changing its name and format. It will be called "Soyomobo." I'm not sure if this will constitute a new restaurant, but I'm leaning towards "yes." Further, Irie Cafe a few weeks ago posted electrical permits. That's further along than the Muffin Man ever got, so I guess that's a good sign. If things had gone according to plan, this might have been my third-longest bike ride rather than the longest. In September 2009, I biked 29 miles in Switzerland, and in August 2009, I biked 28 miles in and around Santa Barbara. So when I decided to sign up for the 28th Annual Bay to Bay Ride, I chose the 27-mile (shortest) route. Some background: the Bay to Bay Ride is a charity ride organized by the Chestertown (Maryland) Lions Club. Riders (some of them) ride from the Chesapeake Bay (Betterton, MD) to the Delaware Bay and back. 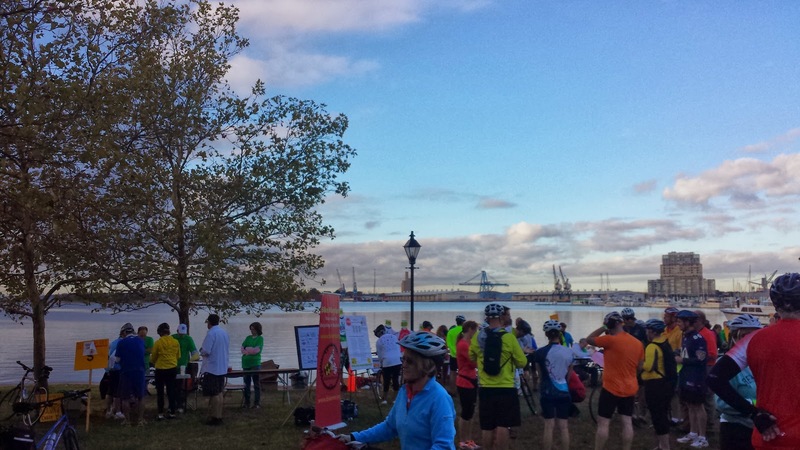 Even the 50-mile ride doesn't get you out of Maryland; that requires 78 miles. 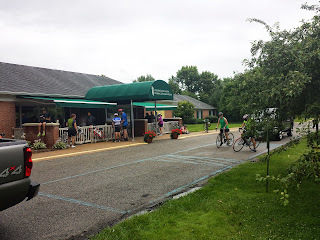 For those who want a loop rather than out-and-back, the 86-mile ride take you back through Chestertown, and the 104-mile ride gives you an extra detour if you want to claim a "century" (hundred-mile bike ride). As I parked a little before 8:00 and started stretching, I noticed that not only did most of the other riders have road bikes, but nobody else sported the type of large saddlebag that I had (most had backpacks). I think that if I do something like this again, I'll try to pack lighter -- rely more on the food stops versus packing my own extra food and water, and maybe replace my U-lock with a cable lock (I didn't even need a lock on this ride, but it's nice to have one just in case). I headed to registration to pick up a cue sheet (turn-by-turn directions) and my t-shirt. Looking at the cue sheet, I realized another mistake (besides overpacking). I hadn't brought my handy Garmin GPS unit that had accompanied me on my other trips. I figured I would track the trip with my phone, which has some fairly nice GPS features. Well, 1) I didn't get data service in Betterton, and 2) I don't have a bike mount for my phone, so I can't stare at the "odometer" and know when to turn. (We'll get to #3 later.) But I figured that since the route was marked with arrows, I'd be OK. Unfortunately the green (27-mile) arrows pointed away from all the other arrows, so I didn't have masses of bike riders to reassure me I was headed in the right direction. 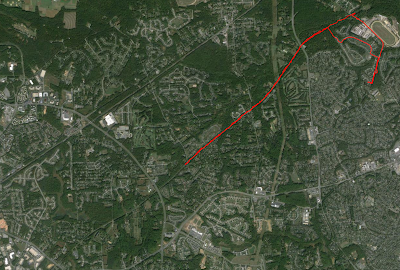 The first few miles were a nice ride -- a bit hillier than I expected from the Eastern Shore, though. I was a bit disconcerted when I came to an intersection and encountered some other riders headed the opposite direction from me. On the other hand, they took different paths from there, so clearly some of them were lost, and who was I to say what paths the non-green arrows led people to? I looked down and saw green arrows -- so I had to be headed the right direction. From then on, I was able to follow the arrows -- once you know what you're looking for (tiny painted arrows on the pavement at almost every intersection), it's not so bad. But it was somewhat dispiriting to have to start over again knowing that I was now headed towards more than 30 miles of biking. 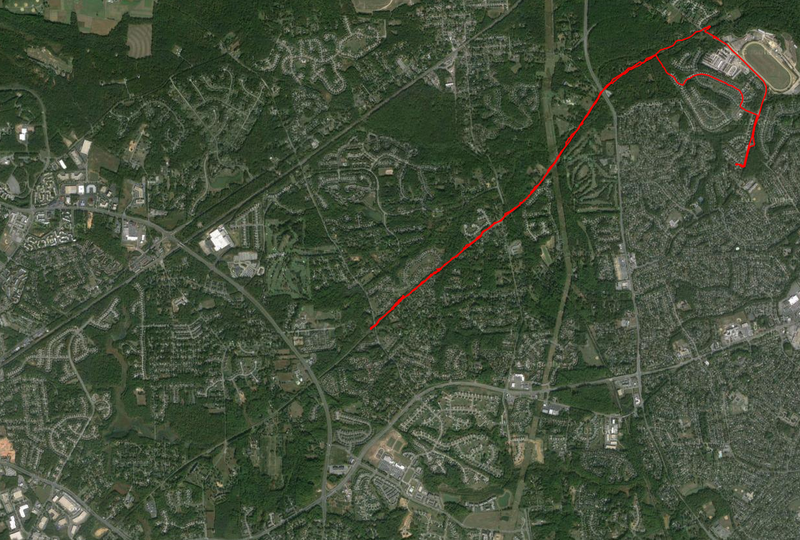 I retraced my steps, and after 2.5 miles, made the correct turn this time. It was a nice enough ride past farm after farm, and when I got to Still Pond Creek, it seemed like a nice body of water. About 7 miles in (for the rest of the post, when I refer to mileage, it's on the 27-mile route as planned, not counting detours), however, it started to rain. I had checked the weather on Friday, and no rain was in the forecast. I was worried about the heat, so I wanted to finish before it got too late, but not about the rain. I hadn't packed any rain gear, and my phone didn't really appreciate the rain (disadvantage #3). 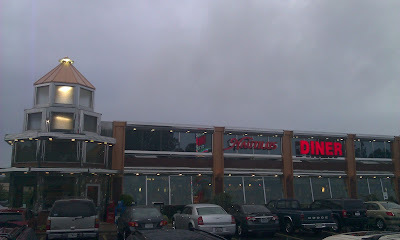 As I biked into Chestertown, the rain let up, and I passed various strip malls. I had the feeling driving in that Chestertown had a quaint waterfront, but I didn't end up seeing it. 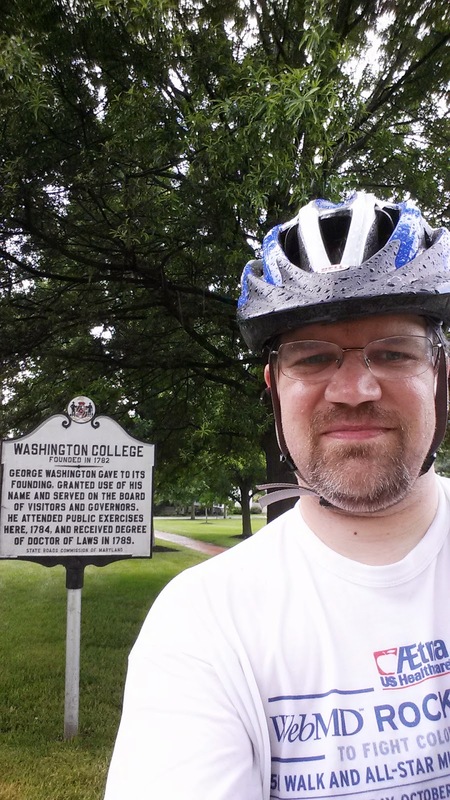 Farther into town, though, I passed Washington College. I was very amused to see signs for "CTY registration." Thirty years ago this summer, I spent the first of four summers at the CTY programs in Pennsylvania, where I studied math, science and other academic pursuits. At the time, there was no Chestertown location, but if there had been, I could have been here! 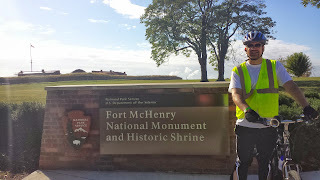 Fourteen miles into the ride, I was at the turnaround point. 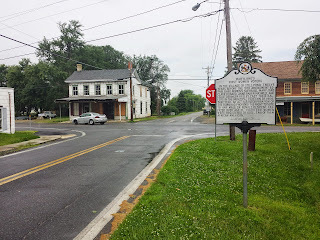 I was invited by the cue sheet to take "A Walking Tour of Old Chestertown." What I really wanted was a bite to eat, though, and I saw that a food stop was available at Mile 16. For some reason, I was expecting a more elaborate spread, but there were some bananas, cookies, and the opportunity to refill water bottles. I was pretty happy with those choices, actually. I had overestimated how hungry I'd get and weighted myself down with two boxes of granola bars. The ride back was nice, though it started to rain again. At the 23 mile point, I passed through the community of Still Pond, which was the first in Maryland to grant women the right to vote. 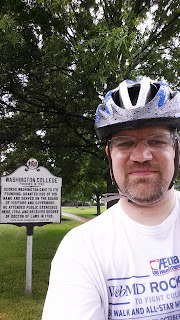 That was one of three historical markers I saw on the ride, but it hadn't been waymarked, so I submitted it. I made it back to the starting point a little before 1:00, as the clouds started to part and the heat began to bear down. My phone counted it as a 33-mile trip. A little bit of that might have been GPS "jitter", where it thinks I've moved because the reading is off, but looking at that map above, it looks pretty straight. I'd love to do this again some time, although likely in a different venue. I'm sort of picky about which rides I'll do -- for example, I'm happy to donate a registration fee to charity, but I'm not going to hit friends up to sponsor a ride. I also don't want hills, a long drive to get there (at almost two hours, this one was a bit much) or a ride over 30 miles. 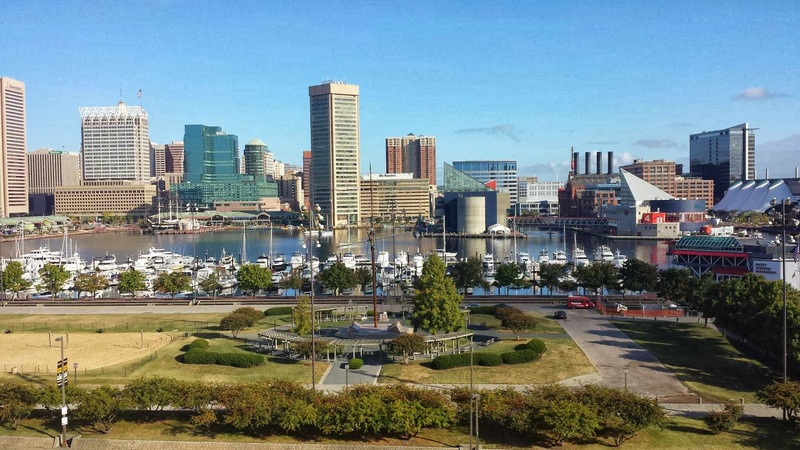 So I've got my eyes set on the Tour du Port in Baltimore in September. The 25-mile ride isn't even the shortest one available, and hopefully I can convince a friend or two to come along. It was a struggle to get through this book, though less so as it went along. The first half of the book comes across as a Star Trek parody, and not a particularly funny one. It's not bad per se; it's just that the observations are on-point without making me laugh. I would have rather read a Galaxy Guest novelization. Wait, there is a Galaxy Quest novelization. I still don't want to read it, although the fact that it's Terry Bisson tempts me a little. The second half of the book gets a bit meta (a story about the story) in a way that put me off Jasper Fforde's Thursday Next books after the first one. Worse, although the plot got more compelling, I realized as I finished the book that I did not actually care about any of the characters. Aside from my Robinson fan-dom, I read this book to get a head start on next year's Nebula nominees. At this point, I'm not sure it'll quite do well enough to get nominated (it looks like KSR hasn't had a Best Novel nominee since 1995), and I'm not sure if it should. On the other hand, I'm not sure what's out there; I'm looking forward to what the voters come up with. Congratulations to this year's Nebula winner for Best Novel, 2312. So now, I'm up to 40 out of 49 read. I have not read any of the other nominees. As part of my reading plan, I started The Killing Moon. The problem is that I fall asleep every time I read it. Since I like sleep almost as much as I like reading, this is not a huge problem for me. Given my lack of enthusiasm for most of the other nominees, I'm pretty happy with 2312 as the winner (especially given how much I like Robinson). And then I'll eventually finish The Killing Moon. 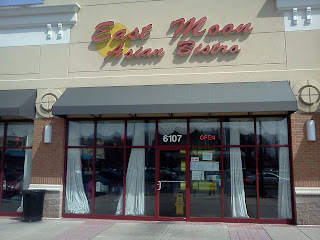 East Moon Asian Bistro, 6107 High Bridge Rd. Somehow Bowie has ended up with three restaurants with "Asian Bistro" in their name. Golden Pavilion Asian Bistro and Ichiban Sushi Asian Bistro are the other two. Having not been to Ichiban since they expanded into an Asian Bistro, I can't yet compare and contrast each of them. But I will say it's tricky to do a review of any of them, since by design they feature a variety of cuisines, which are hard to completely sample in my standard two visits. In addition to one sit-down visit to East Moon and two take-outs, I believe I've had delivery once. The bottom line is that the mix of cuisines generates a mixed bag, but the best of the food is excellent. My main complaint is that the Thai food -- the only Thai available in Bowie -- is the least spicy Thai food I've ever tasted. Also, if you think because you're having Chinese food, you'll order an egg roll, be aware that you'll end up with a "Vietnamese egg roll," which I don't find nearly as tasty. That said, their dishes are generally very well-prepared, and the presentation is very nice. 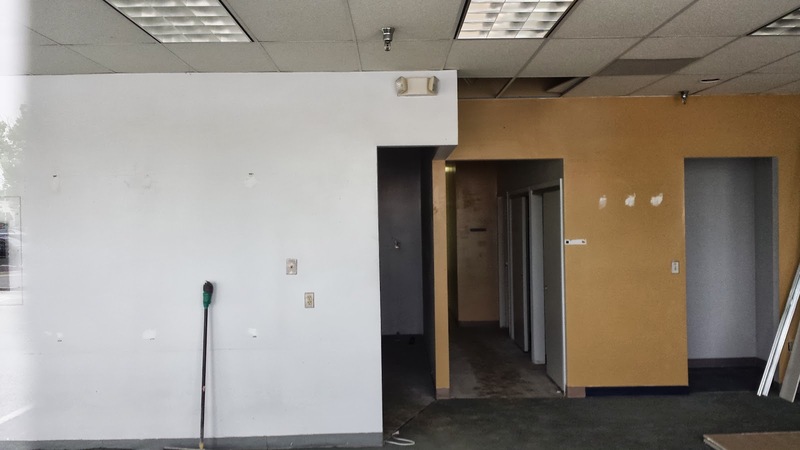 The interior decor is head-and-shoulders above what you'd expect from the strip mall interior. The sushi is good, though I've yet to find the definitive area sushi joint. I'd definitely recommend them, with the caveat that your, "Oh, how exciting, they have that" moment may not live up to expectations. Case in point: Christina was amazed to see that they had "tuna pizza" on the menu. We've had a longstanding discussion about the fact that you can get tuna on your pizza anywhere but the United States. Her observation that this is the case has held up very well. I don't think we've ever failed to find it on a trip abroad, and its absence in Puerto Rico was a sure sign we were still in an American territory. This...was not tuna pizza. 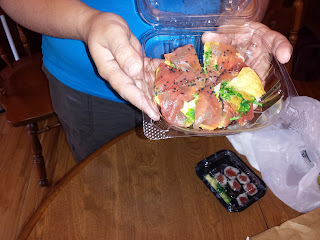 It was tasty, but it was some sort of sashimi-on-wonton thing. So...3.5 stars. It could probably be 4, but the fact that I'm not motivated to drive past Golden Pavilion to get there keeps it at 3.5. Hibachi Bowl is open! Review coming later this month once I make it out there. 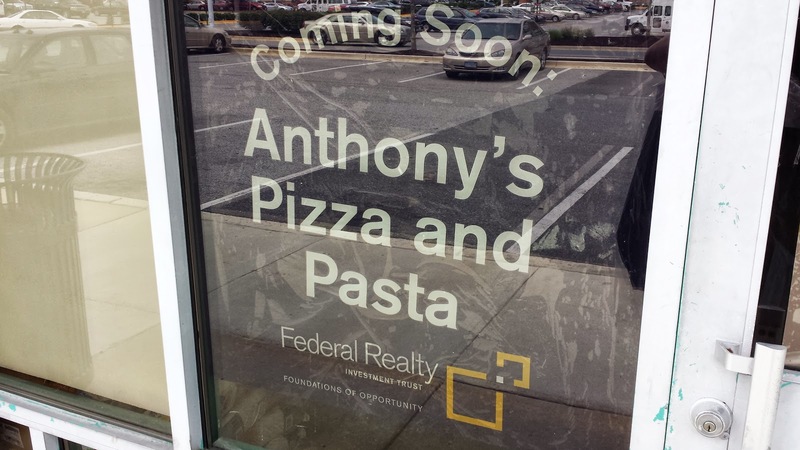 The full name of the restaurant coming to Free State is apparently "Anthony's NY Pizza & Pasta House". That means it's probably related to this one in Clarksville. 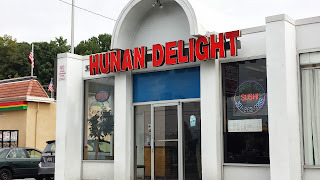 My uncle calls that place, "pretty good, but not outstanding." 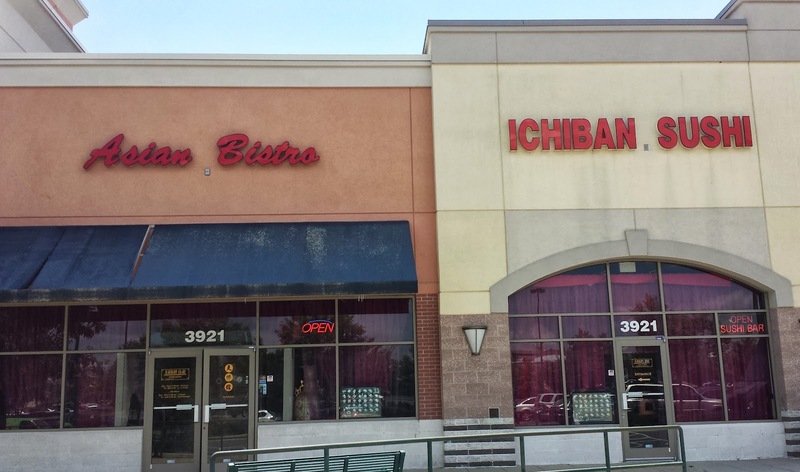 A colleague has confirmed my suspicions that Ichiban is the same place as the restaurant the City has listed as "Asian Bistro" next door, so that knocks down my to-do list by one. Here are the remaining restaurants to review and complete this Project.